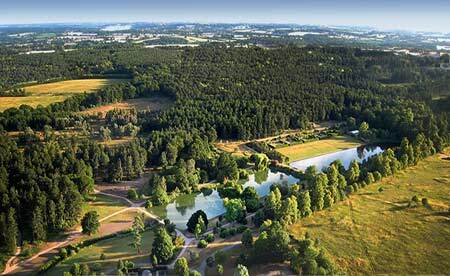 Beaulieu is in the heart of the New Forest National Park in a stunning location overlooking the beautiful Beaulieu River. The Palace House and gardens are home to the Montagu family and the world famous motor museum. It’s an area we know extremely well, being not too far from home and are really excited to be asked to exhibit. 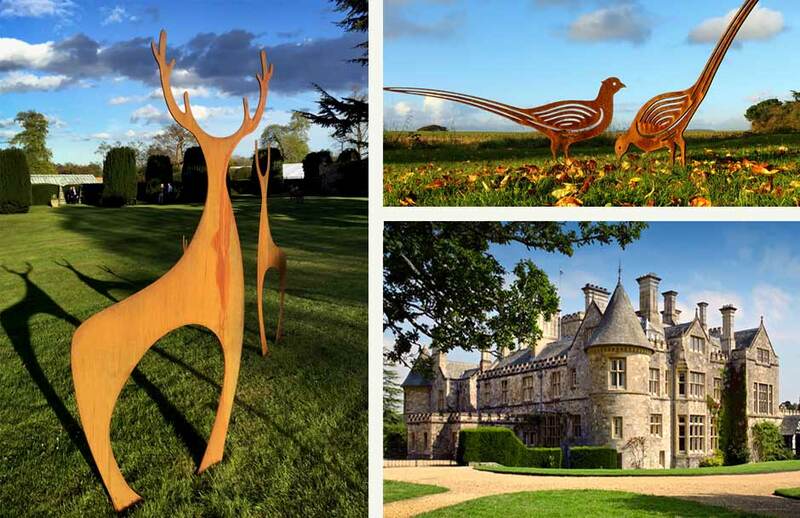 We will be exhibiting our Herd of Deer that should be at home near to the New Forest along with some of our more contemporary bespoke sculptures. The bespoke sculptures don’t currently featur eon the website but please do contact us if you are interested. Prairie Gardens is one of our favorite places and we are extremely lucky to have had our work on display for a number of years and to be invited back again for 2019. Making several visits it’s great to see the gardens change with the seasons and to sample the fabulous cakes.The gardens are stunning, well worth a visit. 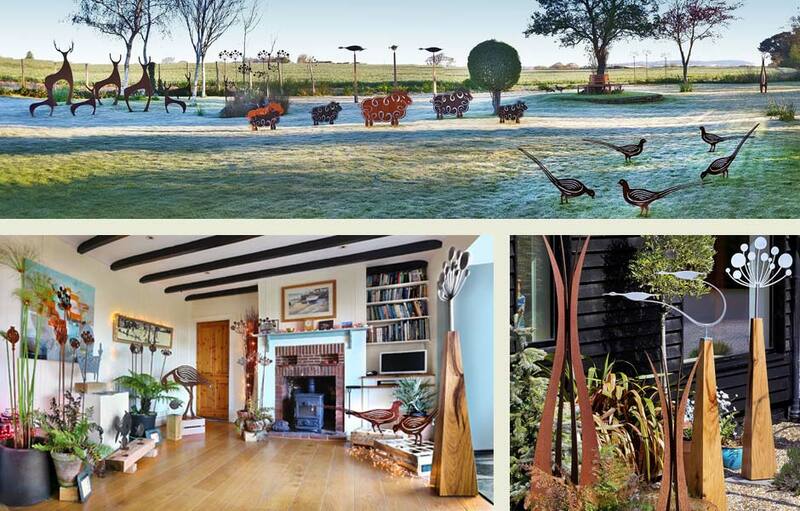 Sculpture is an integral part of the gardens and has been sympathetically installed to further enhance the naturalistic planting.The gardens near Henfield, West Sussex were created by Pauline and Paul McBride. Surrounded by mature oaks, the eight acre garden has a series of arched borders with impressive drifts of plants in soft muted colors which contrasts leaf forms, stems, stalks, flower shapes and textures. The borders encourage exploration and adventure and visitors are welcome to roam along tiny paths in amongst the mighty plants and sculptures to further enjoy the experience. We will be installing our Cow Parsley, Wild Clematis, and Sheep sculptures with the swathes of swaying grasses forming the perfect backdrop for our sculptures. Can’t wait to see them on a summers afternoon with the warm hues of the rusted finish glowing in the sun and perhaps a glass of wine or two. The Unusual Plant Fair on Sunday 1st September is a great event with stalls set up around the gardens. It’s a chance to by that unusual plant from one of the expert plantsmen or one of your favorites from the garden that are available from the gardens own shop. As well as plant stalls, there are a number of artists stalls displaying a range of work to compliment the planting in your garden. The Fair opens at 11am and is well worth a trip. We are really pleased to be invited to take part in the trail as part of an ‘Art in the Garden showcase’ by the Big Plant Nursery and RHS gold medal winning garden designers, Creative Landscapes. 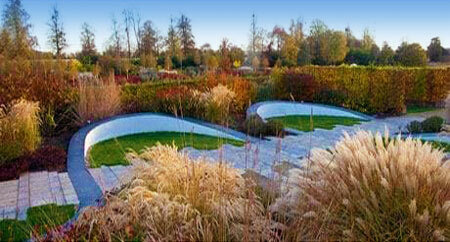 The showcase will feature work by several artists, set off by the mature plants at the nursery, in Twyford near Reading. 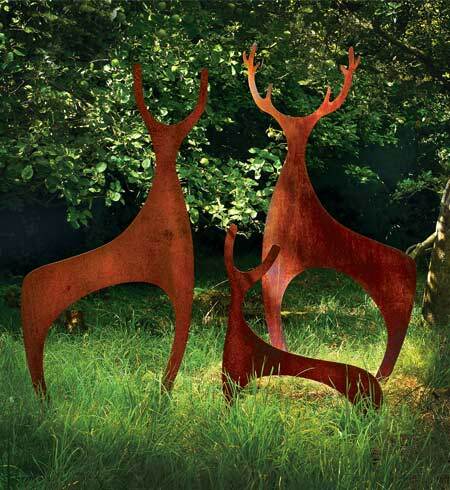 We will be showing a small ‘Herd of Deer‘, ‘A Pair of Sandpipers‘ and ‘A Swathe of Wild Clematis‘. Now in its 14th year, Henley Arts Trail is bigger and better than ever and formed of 32 venues which can be found between Bix in the north and Twyford and Waltham St Lawrence in the south. Those venues are host to artists from well known award winners to wonderful up and coming artists. and will be adding the details in the near future.